MWF maps comparing the brains of contact sport players 3 months after mild traumatic brain injury with the non-contact sport player baseline. A: Sagittal (left), coronal (center), and axial (right) MWF maps at the level of the thalamus showing increased MWF (p < 0.05, FWE corrected) in the anterior and posterior corpora callosa, thalamus, and midbrain. 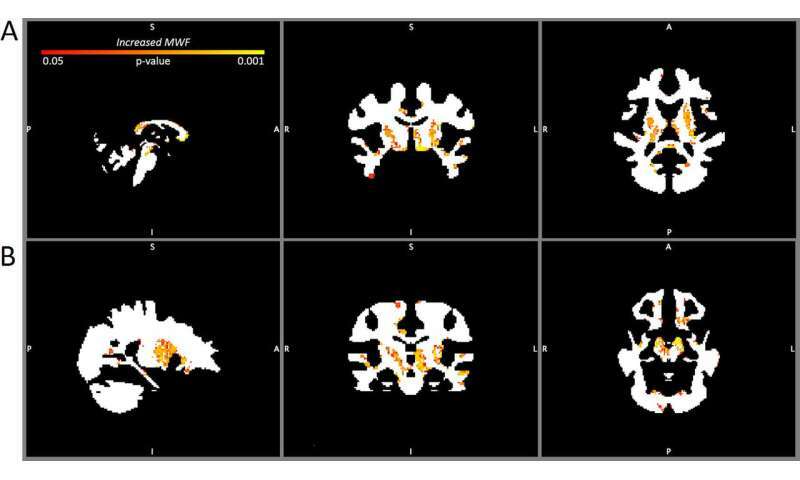 B: Sagittal (left), coronal (center), and axial (right) MWF maps showed significant MWF increases (p < 0.05, FWE corrected) in the midbrain and temporal lobes (left > right temporal lobe). Credit: American Association of Neurological Surgeons. Preliminary research using mcDESPOT magnetic resonance imaging shows changes in the myelin content of white matter in the brain following mild traumatic brain injury. Myelin changes are apparent at the time of injury and 3 months afterward. For more details, see the article, "Prospective study of myelin water fraction changes after mild traumatic brain injury in collegiate contact sports, by Heather S. Spader, MD, and colleagues, published today in the Journal of Neurosurgery.